began her dance training at the Marcia Hyland Dance Center at the early age of 2 1/2. In addition to becoming a dedicated member of our Dance Company, she is a gifted instructor with a vibrant, motivating personality! Nicole Lewandowski earned her B.A. degree in Business Management, but not without continuing the theatrical career path that she dreamed of since childhood. For five consecutive years she performed with the Marcia Hyland Dance Company in the Miss New Jersey Pageant, giving her the necessary introduction to the “world of pageant.” She then combined her experience in dance, modeling and choreographing and won first place as “Miss MAAI” (Modeling Association of America International), a prestigious modeling and talent competition held at New York City’s Waldorf-Astoria. This led her to choreograph for the John Robert Powers modeling competitions in Philadelphia. Her busy career also includes acting as Spokesperson for Coca-Cola Bottling, Nabisco, Ocean Spray at their annual conventions and industrial shows. In June of 2017, we celebrated the marriage of Nicole and Mike Lewandowski! 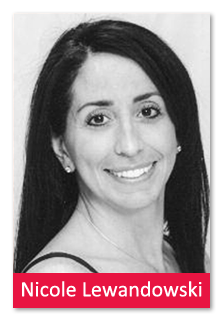 With her extensive background and talent, we’re fortunate to have Nicole as a faculty member at our Dance Center!